Am Byth® is forever at the heart of Clogau. With its elegant Tree of Life® filigree and touch of rare Welsh gold, this timeless collection of signature pieces is the ultimate way to profess your endless love. The silver and rose gold earrings are set with 6 diamonds and contain rare Welsh gold. My wife has collected Clogau jewellery for a number of years which provides me with ideas to buy her gifts for all events i.e. Christmas, birthday, Valentines Day etc. With regards to this years gift, I know she will not be disappointed when she opens her presents on Christmas Day. Excellent workmanship as usual. Good, navigable web site making it easy to find exactly what one wants. Straight froward ordering process culminating with prompt delivery service. 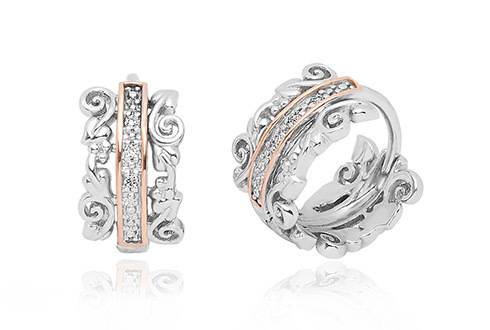 I will return, immediately prior to the 14th February for her next piece of Clogau jewellery. I received these beautiful earrings as a valentine gift from my husband (although i chose them) they are so comfortable you do not realise you have them on, if you like the huggy style of earring you will love these. The detail is incredible, they are stunning, another fantastic piece of Clogau to add to my collection.